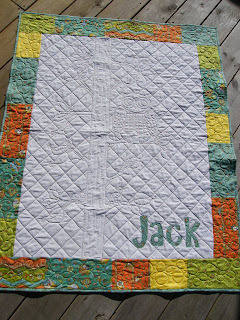 How lucky for me that Baby Jack is not here yet. 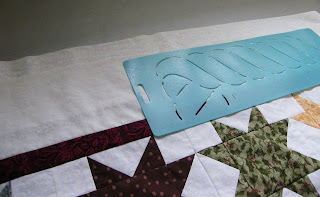 While we have been waiting, my sister and Mom-to-be Michelle have been helping me with a big fusible project. I had no idea how much work this project is... and how important it is to be organized. It's so big for me, it's overwhelming. I now realize that it was meant to be... three heads are better than one. The three of us worked three full afternoons to get me this far. The fun multi-part different colored shapes had to be traced onto the lightweight fusible, then the centers cut out of the fusible. (so it would not be stiff). 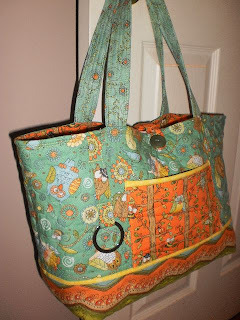 After that we spread a variety of fun colored fabric out and ironed all the fusible shapes down. I'm sure there were over 150 shapes. Then it was time to cut out all the shapes and sort. 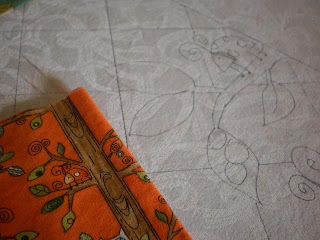 Then layout the placement plan according to the pattern instructions, while considering color placement.... Whew, time for a cup of tea and a brownie. I'm now all organized and ready for the next steps of this project, and I can take it from here. Because it's a big project and I have other things that I'm working on at the same time, I'm going to work on this one and report on it every week. My plan is to have it done in 6 weeks. Watch for a Week 1 report in just over a week! My sister is visiting. She and my niece (who's due date is tomorrow - Friday) visited today, and helped me start a big quilt project. It's been on my to-do list for a while. It dissappeared off my list for a while, then came back on recently. I'm going to try to have it done for Christmas... It's so nice to have help to get a good headstart. There's math involed. Sorta..
Before any of the real quilting starts, there's lots of fusable applique that needs to be prepared. I've been through 3 yards of the Steam-a-Seam II lite already today... I need 3 or 4 more yards. Whew, that's a lot of tracing and trimming. The pattern is complicated. 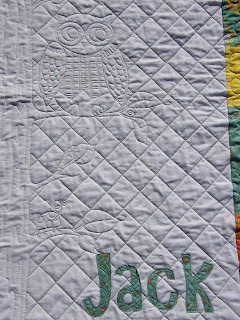 My sister took some quilting homework with her home, and will trim more of my shapes this evening. Tomorrow, barring no other more important things to do, we will iron our little cut out pieces to the fabric, and do the final trimming. 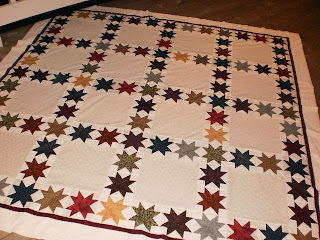 Then I can start to work on the quilt. So in preparation for their visit tomorrow, I'm making these Espresso Shortbread cookies to have with our tea break in the afternoon. Instant Espresso powder is hard to find in the grocery store, so my sister brought me some from Nova Scotia. The dough tastes good.... It's going to sit in the fridge overnight and I'll bake them tomorrow. This recipe was kind of fun since you have to put the dough in a large ziplock bag and roll out to 9 x 10 size. - No mess. I'm glad I had my quilters ruler at hand to measure. I know these shortbreads will be tasty, so I'll give you the recipe now. Watch for a picture tomorrow. Dissolve espresso powder in boiling water. Set aside to cool to tepid. Beat butter and confectioners’ sugar together on medium speed for about 3 minutes, until the mixture is very smooth. Beat in vanilla and espresso, then reduce mixer speed to low and add flour, mixing only until it disappears into the dough. Don’t work the dough much once the flour is incorporated. Fold in the chopped chocolate or chips with a sturdy rubber spatula. Using the spatula, transfer dough to a gallon-size zip-loc bag. Put bag on a flat surface, leaving the top open, and roll the dough into a 9 x 10 1/2 inch rectangle that’s 1/4 inch thick. As you roll, turn the bag occasionally and lift the plastic from the dough so it doesn’t cause creases. When you get the right size and thickness, seal the bag, pressing out as much air as possible, and refrigerate the dough for at least 2 hours, or for up to 2 days. Preheat the oven to 325°F. Put the plastic bag on a cutting board and slit it open. Turn the firm dough out onto the board (discard the bag) and, using a ruler as a guide and a sharp knife, cut the dough into 1 1/2-inch squares. Transfer the squares to the baking sheets and carefully prick each one twice with a fork, gently pushing the tines through the cookies until they hit the sheet (okay, I didn’t poke the cookies and they’re fine). Bake for 18 to 20 minutes, rotating the sheets from top to bottom and front to back at the midway point (I didn’t do that either – I bake one sheet at a time). The shortbreads will be very pale–they shouldn’t take on much color. Transfer the cookies to a rack. If you’d like, dust the cookies with confectioners’ sugar while they are still hot. Cool the cookies to room temperature before serving. Makes about 3 dozen. Today was a fun day. We travelled to Saint John to visit with Aurora and her mom. While there, we went into the shop for a bit of hair care. 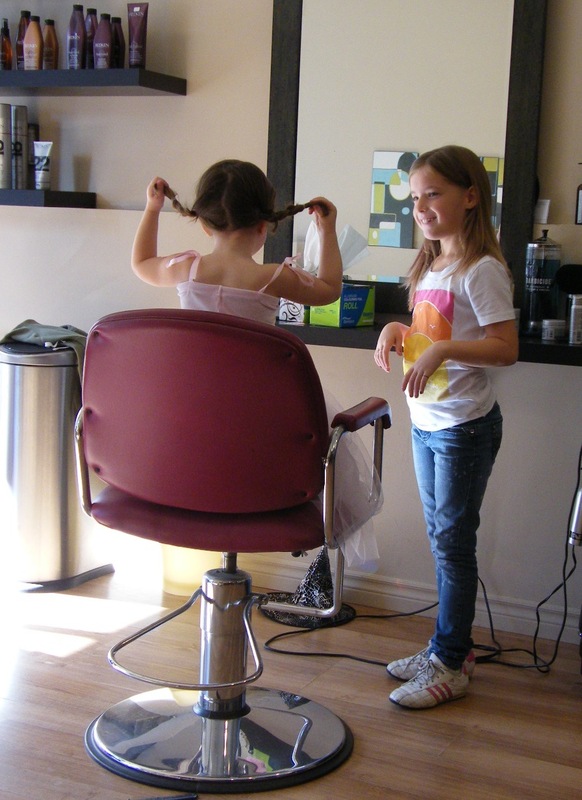 ﻿﻿﻿﻿﻿﻿Caitlin has always said she wants to be a hairdresser when she grows up. 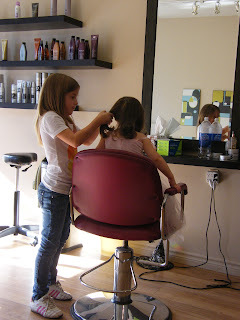 Well today she was in her glory playing hairdresser with Aurora. Aurora was so pleased with her new pigtails. I was in the other chair getting my hair done. Only a good hairdresser knows how to keep a squirmy princess still. I'm not sure who's prouder here...the customer or the stylist!! Guess who's going to be a witch with pigtails this halloween. And when we got home, a sewing machine for the triplets to use that their house. Caitlin is now the family expert on this machine. 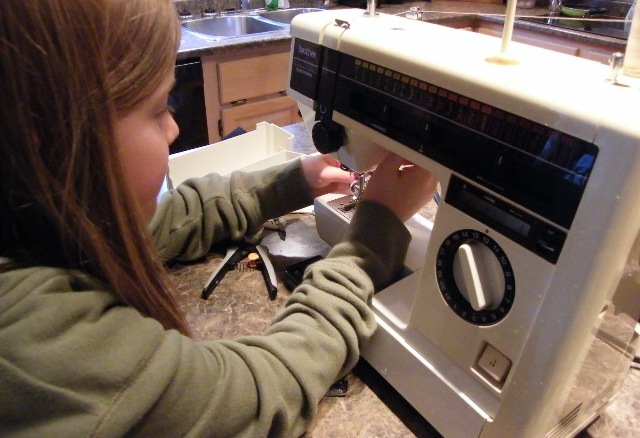 She knows how to bob it, and thread it and she's tested out all the stitches. On our way to a baby shower today, we dropped into the Elm City Quilt guild fabric yard sale. Grace and I were browsing and it all started with one of the quilters who had a "freebee" bucket of remnant ends. We were chatting a bit with this quilter, and she invited Grace to take something from the freebee bucket. See, Grace is such a kind hearted girl. 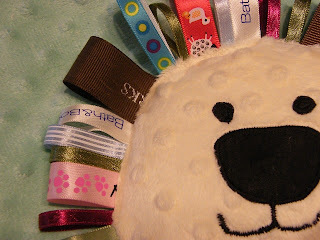 She loves to make things with me, to give to the SPCA. So Grace took some nice blue fleece. You might recall last month, we used up some buckwheat to make magic heat bags and covers for the kittens at the SPCA. Grace wasn't sure what we would make with her new bit of fabric , but she would think of something. Well, we didn't intend it, but as we made our rounds from table to table, and everyone would make a comment about the fabric bundles that Grace was carrying...When they heard what Grace was going to use the fabric for, everyone was quick to donate some more fabric for Grace's cause. It just warms my heart when people are kind... just like Grace is kind to the animals, the Elm City quilters were kind to Grace. We left with our bundle of goodies, and went on to the baby shower. We really enjoyed the baby shower and meeting up with lots of cousins and to have a nice chat with Jana, the mom to be. After the shower, we left to come home with our fabric goodies and Grace started to sort the fabrics and decide what we should make. So in an hour, here's what we made .....so far. 4 doggie neckerchiefs. Grace says there's mostly big dogs at the SPCA. When they wear these kerchiefs, they will look especially handsome when somebody comes to adopt them. 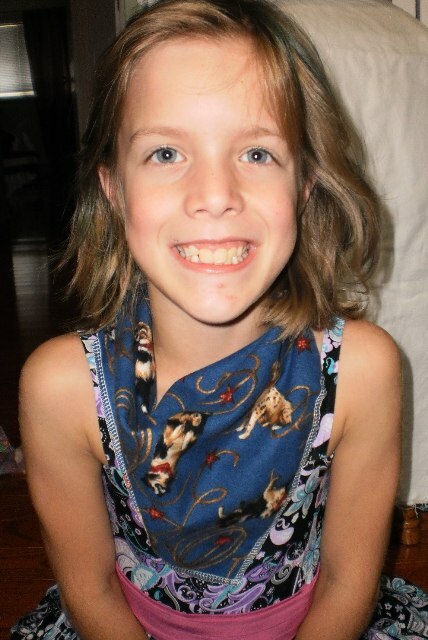 Grace is modeling the dog kerchiefs here. 3 small fleece kitten sleeping mats - if you know cats, you know they love small fleece blankets. Grace says there were 7 kittens at the SPCA last time she was there. 1 small blue fleece puppy blanket - Grace said that there's a dog at the SPCA that needs to have skin tags removed, that this would be a nice comforting blanket for him. 1 small fleece tote bag to carry toys in. 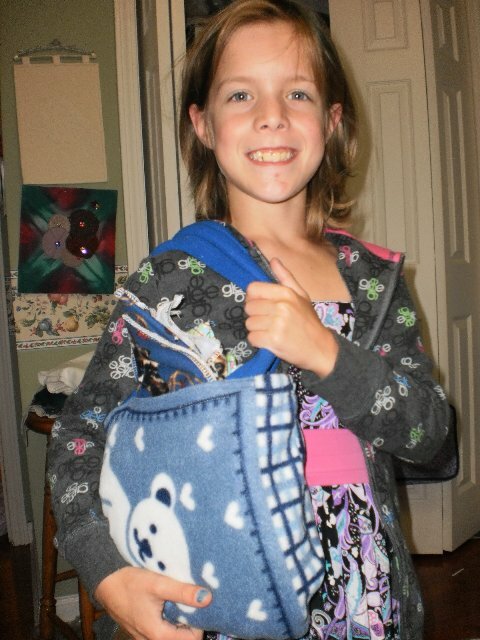 Grace thinks she will keep that bag for herself to tote around her two favorite stuffies, Pete and Shelly. Thanks Elm City Girls. 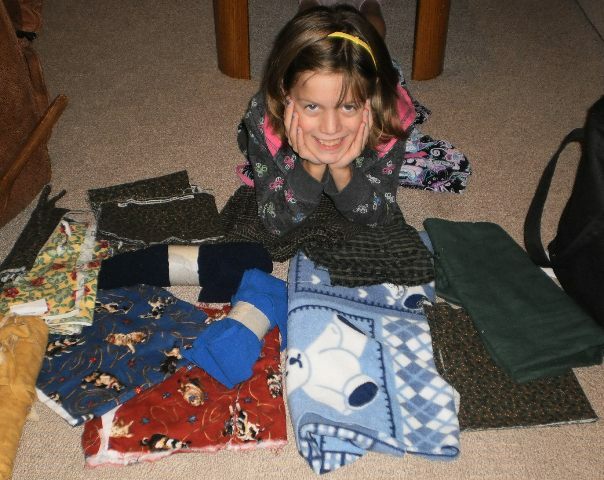 Your kindness was remarkable and Grace was so impressed that "quilters" are so nice to give her the fabric for the SPCA. Grace and I are going to a family baby shower tomorrow. My niece Jana is going to have a baby in December. As you know I babies, and especially love making baby things, so a baby shower is a fun time to make some nice soft and cuddly gifts for a new baby. I also used Natalia's tutorial to make a couple of self-binding receiving blankets. Even though they are square receiving blankets, I've folded them to show that they can be used as swaddling blankets. They are made out of two layers of flannel so you can imagine how soft and and cuddly they are. 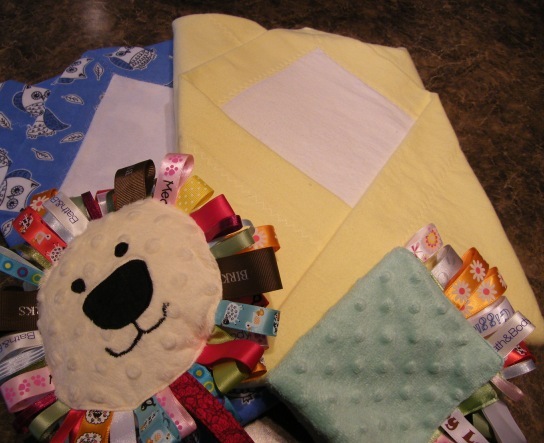 And since I had the ribbons out, I made a couple of regular taggie blankets to include in the gift package. Hmmm, I wonder what she'll have.... a Girl or a Boy!! The very last stop while in Amherst, was the open house of Bent Cottage Creations. We heard that our little visit would be special. And it was. The birdhouses were made by Don Miller out of reclaimed wood and other recycled things. It would have taken a couple of hours to inspect all the quirky details of each one but each was very unique. I bought a sweet birdhouse, that appears to have polka dots on it, but they are actually slices of a tree. Don says these birdhouses are intended for the outdoors, but this one will sit in my house to enjoy for the winter. I may put it outside in the spring. We'll see. Have a look at some of his other bird houses. They're all so nice. Halloween Birdhouses - Yes, they're functional. All made out of reclaimed wood. Some have a real rustic look. Was it Julie Andrews who sang "A few of my favorite things"? Well, here are a few of my favorite things that I bought in Amherst last week while visiting the Fibre Festival. The Fibre Walk took us on a search of art pieces in many of the businesses around Amherst. 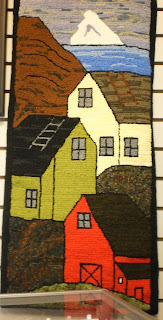 Near one of the Fibre Art window displays, we found a fabulous consignment center and look what I found. Beautiful long white gloves. I knew right away, these would be a perfect complement for Jessica's corpse bride costume. I love the stories of the bees that Karen and her hubby raise, and work. She has fabulous stories of catching swarms, moving the hives to places where they can do their bee work. And of course managing the bees day to day are great stories in itself. And where there's bees, they're honey. It was the first thing I did when I got to Amherst. I found the Fibre Festival headquarters and bought up some of that honey to bring home to the kiddos. I also knew ahead of time, I would pick up some of Karen's local bees wax for hand quilting. They say that if you run your thread along the side of the bees wax, it will reduce the tangles in the thread. Well we're going to try it out this year when we start up hand-quilting at St. Anthony's... - that would be today!! I've been making these cookies for years. The recipe makes 25 perfectly sized cookies. 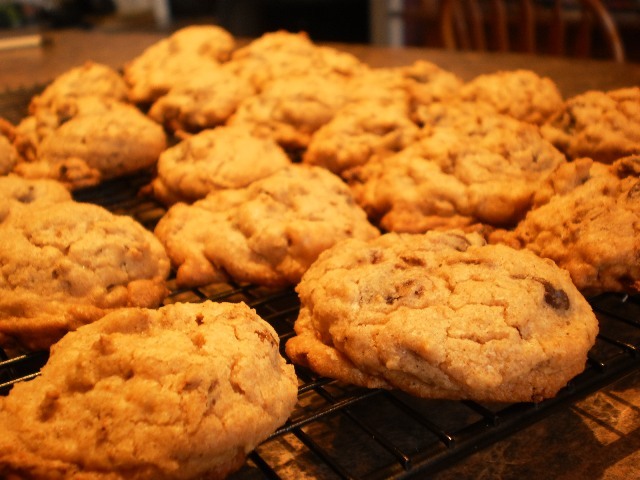 I fill my large cookie sheet once, and the cookies are baked quickly. I love that I don't have to use a separate cookie sheet to put 10 or so cookies on. I use my truffle sized ice cream scoop. These cookies are sorta healthy because they use a bit of All-bran. Sometimes I throw a handful of chocolate chips in so does that counter the bran, and maybe they are not that healthy. :) If you ask all my kiddos, what is Grampie's favorite cookes, they know exactly which ones they are. 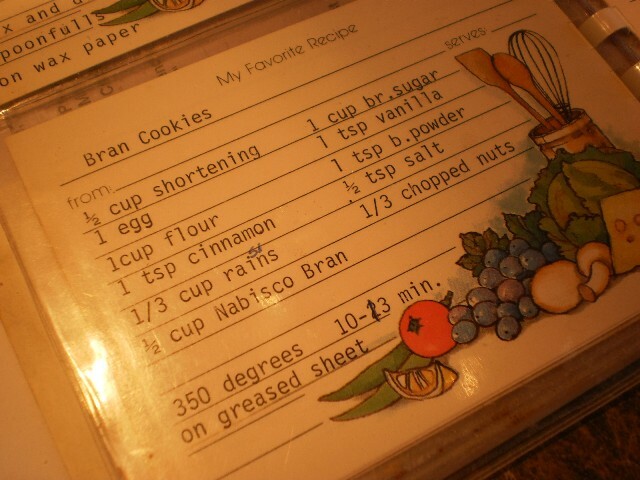 In my recipe book, they are known as Bran Cookies. 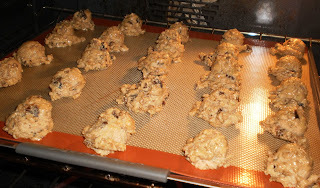 So, Grampie loves oatmeal cookies... but I don't have a nice small recipe, that makes aboaut 25 cookies. The recipe I have spread too much and I can only fit about 16 cookies on a sheet. I would love to have a great Oatmeal cookie recipe that makes 25 cookies that don't flatten out too much. Got one to share? Here is my recipe if you happen to have All-Bran in your pantry. 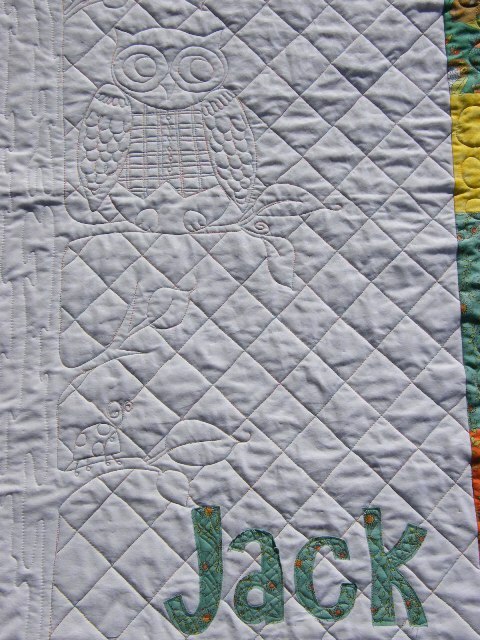 This is the first time I've ever marked a quilt. It has to be marked and ready to go on the quilt frame at the church by Wednesday afternoon. I have some templates in my stash. I have no idea where I got them. When looking through them, I found this rope template. It fit the border of St. Anthony's quilt perfectly. Using my FriXion pen (which I love), I started to mark....what the heck. If it didn't work out, I could iron off the marks. This was an easy template to adjust if it doesn't quite work out. I liked using it. It took 1 hour to mark. Whew, the borders are done. Next... the sixteen large white squares. I'll start on that tomorrow. Linda had such a nice couple of days in Amherst. I have lots of pictures to go through, so for now, I'll just show you a few things today. Watch for more next week. 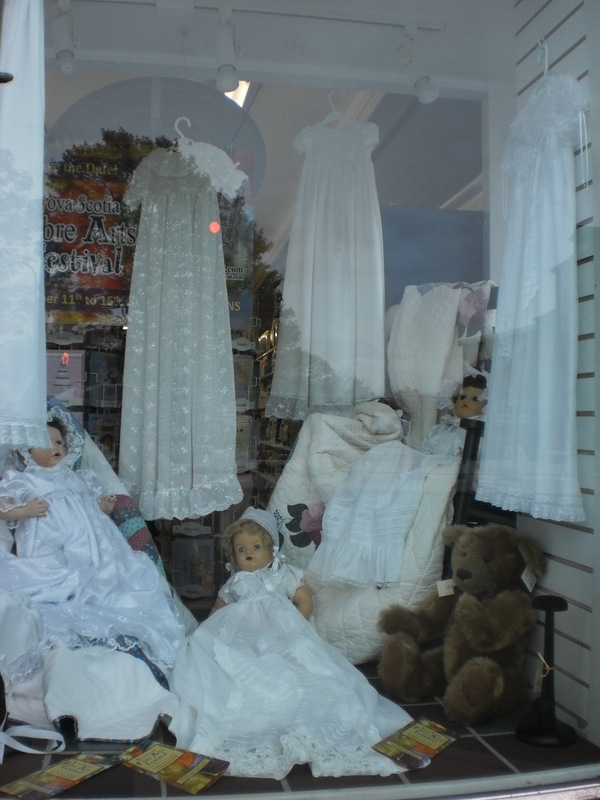 There were many stores window displays that were part of the Fibre Fest Walk. This display of Heirloom Christening Gowns by Celina White was my favorite display. If you know me, I love baby stuff, and seeing all these baptism gowns reminded me of when I made gowns for all my grandkids... These are beautiful, and I really enjoyed looking at all the techniques. 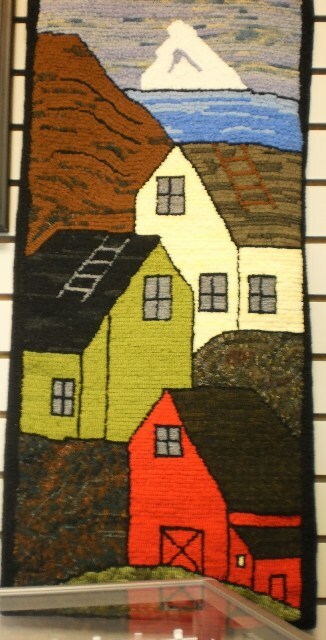 Hooked rugs are so popular, and there were wall rugs at many of the viewing stations on the Fibre Walk around town. 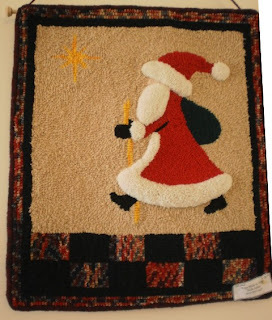 I loved these hooked rugs. Image from the Lorali Embroidery Designs. 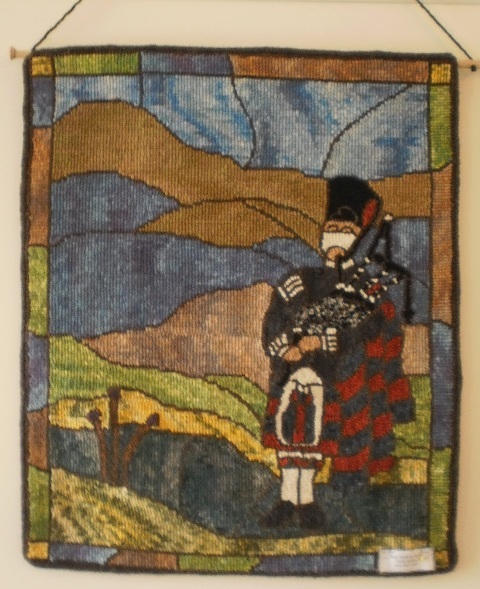 My friend Linda H. and I are headed to the Nova Scotia Fibre Arts Festival in Amherst for a couple of days. In particular, this afternoon, we'll be visiting the display and sale of Karen Neary Quilts. You are invited too! Check out her invitation for details here. We usually keep up with Karen via her blog. So, it'll be fun to meet up with her again in person. Maybe I'll see you at the festival. Keep an eye out for me.... 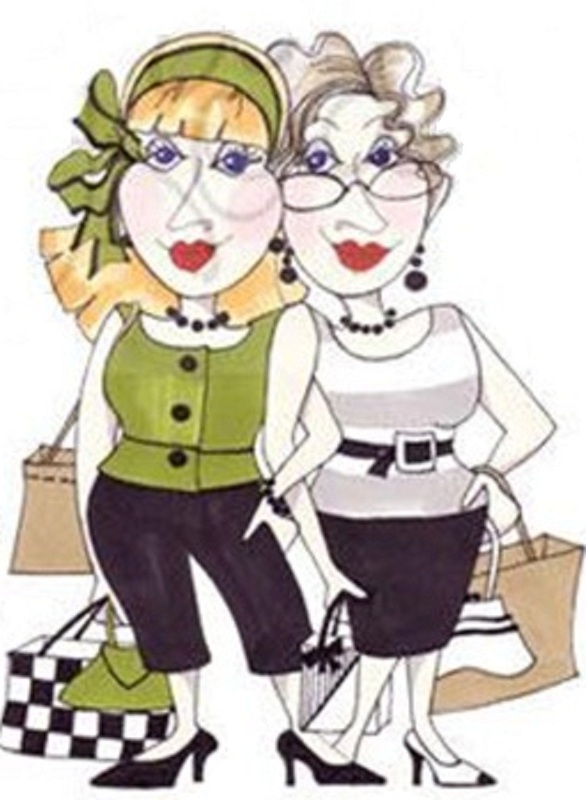 I'll be the one with the fabric handbag, and wearing a quilted jacket!! I'm trying to decide what name to give this quilt. I like the sound of "Stars for St. Anthony". I have lots of time before I have to make a label, so I'll take suggestions. I finished sewing the borders on it today and I'm so pleased with it. Sounds like a rainy weekend ahead, so I plan to mark it then. Next Wednesday, we will hang it on the quilt frame at the church and thus begins another fall and winter hand-quilting project. 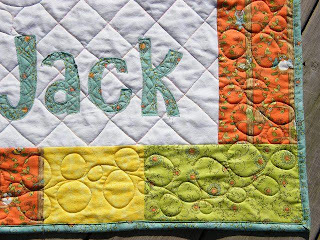 I'm so pleased because in addition to our hand-quilters from last year, we have at least two more people joining us on Wednesday afternoons. I know I say it every year...But Thanksgiving is really a great celebration. 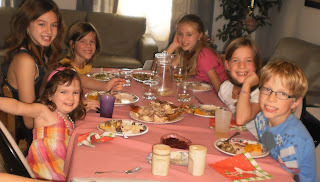 We had all our kids and their kids over for a big turkey dinner. We've been roasting a turkey all day. And like everyone else, we can't get over the beautiful weather for the past few days. Jessica and Emily came for a visit a day early. As usual, we had a long list of things to do. Jessica wanted to work on a Halloween outfit. 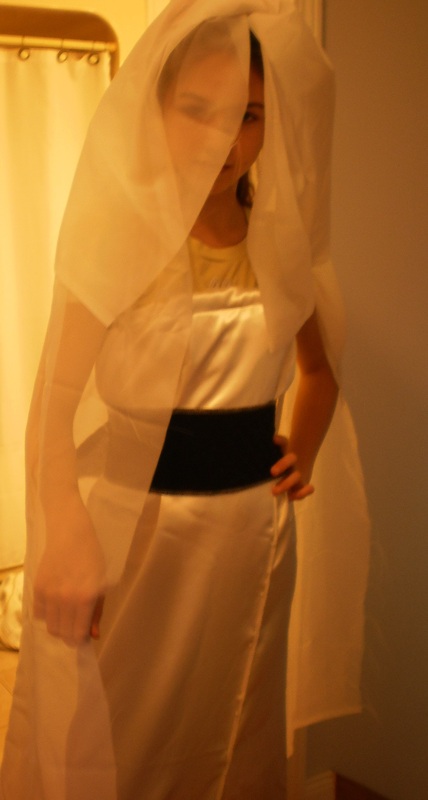 She's going to be a corpse bride. ...a dead bride.... yuk....but once we did a little research, we made a fabulous wedding outfit. Now the rest is up to her to find a bouquet of dead flowers and do a good make-up job. I love her mysterious look under that veil!! 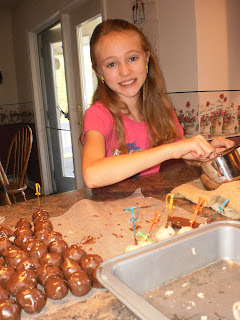 As a treat for the rest of the guests we were expecting for supper, we made "cookie dough truffles". 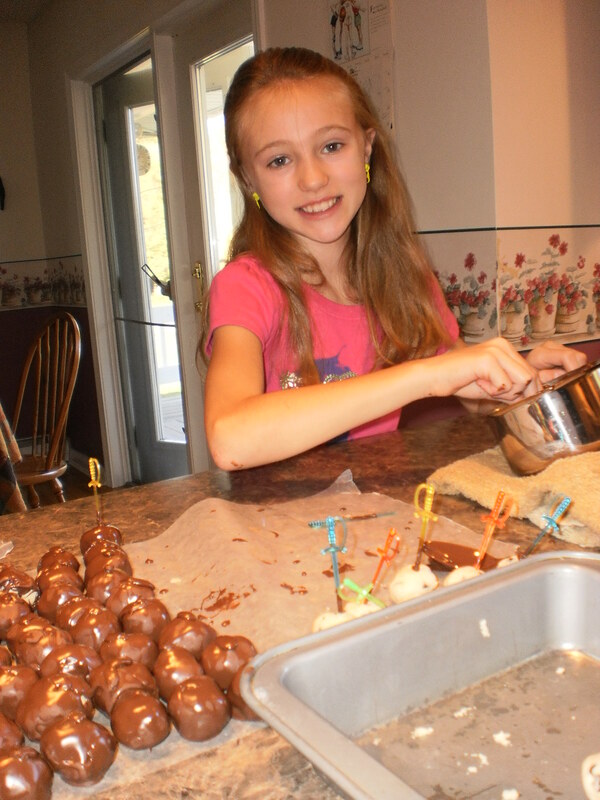 Emily is doing the dipping of the truffles into the chocolate in this photo. These truffles were a real hit. The recipe made at least 3 or 4 dozen. There is not one left in the fridge. As the kids were making up the recipe, I noticed that there was a lot of "taste testing" going on. "You know, Quality Control Grammie", they would say. I quipped back, but you know kids, the Yield on this recipe says more than 6 truffles. They laughed and laughed at that. But seriously, don't those truffles look so delicious. 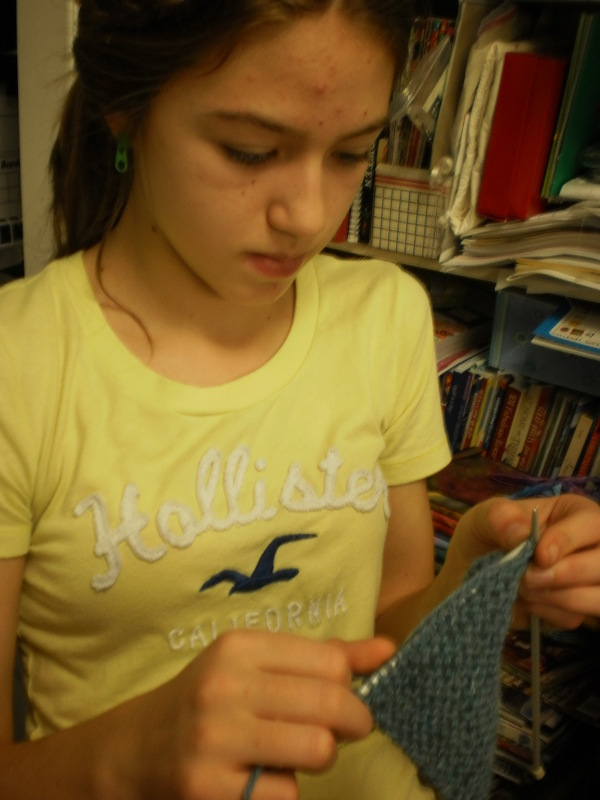 Jessica is has been practicing knitting for a few months now. So today, she knit a whole project. A coffee cup cozy for her mother. She knit the whole thing herself and it fit her mothers favorite mug perfectly. I totally forgot to take a picture, but it was sweet. And finally, here is a picture of all six of my wonderful grandchildren at our Thanksgiving supper table. Aren't those all beautiful smiles. Well, for about a week now, I've been so close to finishing my 128 blocks and today, they're done. Yippee They're pressed and stacked. Now the fun part is to lay them out and see what my fabric choices look like. It seems like I've been working on the blocks forever!! But it's only been since mid-August. And take away the couple weeks we were on vacation, and a week of jetlag recovery, it's not to bad. This is the layout. I haven't put the white squares in yet, but they are done. I just wanted to get the idea what the quilt will look like with the fabrics that I chose. I like it. There are mostly darks...mediums.. with lots of colour. reds, golds, greens and a few blues. But in the picture above, do you see that stack of blocks on the lower part of my layout - they're extras. I'm totally confused. It's not the first time I've been confused with my own notes. I dig out my little green paper with my quilt plan notes. Yep, there it is in writing.. I needed 128 blocks. But in actual fact, I now know that I only needed 105 blocks...Really, I thought this was a no-brainer. But I guess I should be running my quilt math notes by my mathy friends to see if my plans make sense.... gesh. None the less, I'm a happy quilter today, and I'm glad to be moving on to the next step. That is sewing the blocks together. I need to have it done by the weekend because I have some kiddos coming on the weekend for Thanksgiving, and they'll be sleeping on that bed!